What kind of Cooking Class should I go? Cooking class shanghai forum. You must know what's your purpose to learn Chinese cooking before you decide which classes and courses you should attend. c. Some foreign friends who want to see what is professional Chinese cuisine. Anna's Healthy Chinese Cooking Class is home style healthy Chinese cooking class. No deep fry, no MSG, and turn complicated procedures into easily followed several steps. We pick fresh natural food, cooking from scratch. You can cook at once after going back home. Some dishes are traditional home made. You won't find them in restaurants. If it's small group, we'll cook at residential apartment. You can experience real Chinese people cooking life. If you are with health conditions such as celiac disease, heart disease, or diabetic, we'll fully communicate with you and arrange foods and cooking methods tailored for you. g. Some friends who want to learn heart healthy cooking, or cooking for diabetics,high blood pressure people. h. Some friends who want to learn cooking weight loss. I am Nacho from Barcelona chef in vegetarian restaurant. 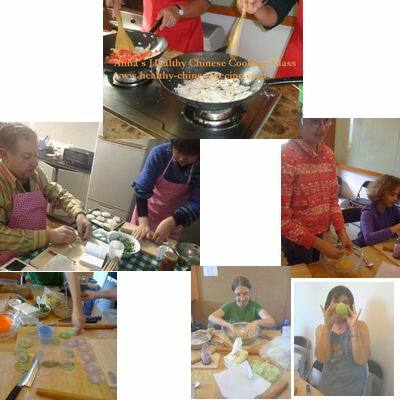 It was a beautiful experience cooking with Anna and your friend authentic cooking from China. It's so fun and the food is delicious. The teacher is patient and guide clearly. he dumpling making is cool. I can make different color Jiao Skin. The fish soup can be cooked in such short time! And it's simple and delicious!